The Fernley Swimming Pool is currently CLOSED due to a mechanical failure. We will be open Saturday the 20th with our normal schedule. Saturday, April 27th - CLOSED - High School Swim Meet. Sunday, May 19th - CLOSED - Regional Training. Saturday, June 29th - SCHEDULE CHANGE - Swim Across America Charity Event 8 am - 12 pm. The Fernley Pool offers Red Cross swimming lessons for children of all ages and skill levels. Classes are split into skill levels to best meet the needs of any child, no matter their swimming ability. The Fernley Pool and Park is happy to host your next special occasion. The Pool, Splash Park, and Picnic areas are great places to host anything from a birthday celebration to a corporate event. The Fernley Swimming Pool offers Aqua-Fitness classes with various times and instructors throughout the day. Feel free to drop in on any class with no enrollment requirements needed. The Fernley Swimming Pool and Park features a competitive pool with two water slides, a small children's pool with water sprayers, a surrounding park with grills and shaded seating, and an outdoor seasonal splash park. The Fernley Swimming Pool staff are well trained and well equipped to meet all your aquatics needs. 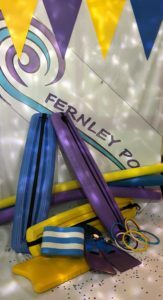 The staff of the Fernley Swimming Pool works hard everyday to provide our community with aquatics programs that are both enjoyable and affordable. The Fernley Swimming Pool hosts lap and open swims, aqua-fit classes, water slides, and a children's pool year round with an outdoor splash park in the summer months. We provide Red Cross certified classes in swimming, lifeguarding, and life-saving techniques like CPR and first aid taught by our Red Cross Water Safety and Lifeguard Instructors. Surrounding the pool, the park, grills, and picnic areas are open every day for everyone to enjoy. The staff are always striving to provide for the community a place to workout and enjoy that is clean, fun, and above all, safe. The Fernley Swimming Pool is proud to host Red Cross Certified classes. The Fernley Swimming Pool keeps American Red Cross Instructors on staff to instruct both community and professional classes. We offer classes in Lifeguarding, GuardStart, CPR/AED, First Aid, Emergency Oxygen, Blood Borne Pathogens, and much more. Many classes can be offered on demand. Contact us today to inquire about upcoming classes to to request a class.